Today, I'm back and sharing with you two more projects that I created using Kaiser Craft's beautiful Mint Wishes collection, some products from Tonic Studios and Tim Holtz's Plaid Layering Stencil. 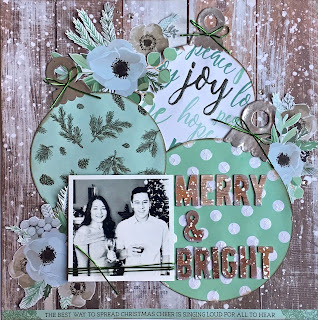 To kick off my projects, I created a pretty 10" x 10" layout featuring some of the papers and collectable cut outs from the Mint Wishes collection. 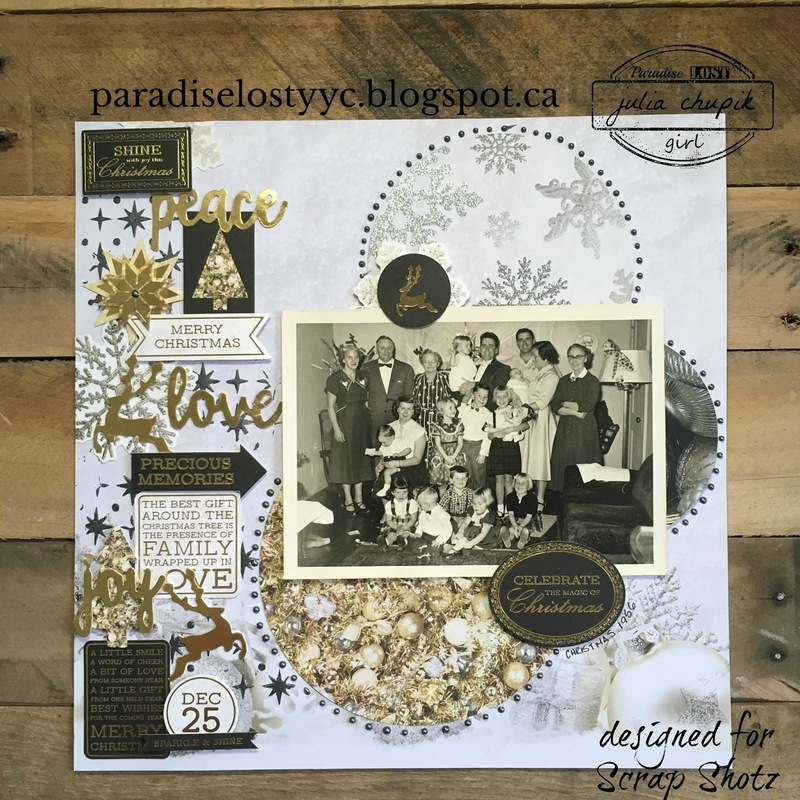 I've started to really love creating the smaller layouts and stepping out from just doing the traditional 12x12 layouts. 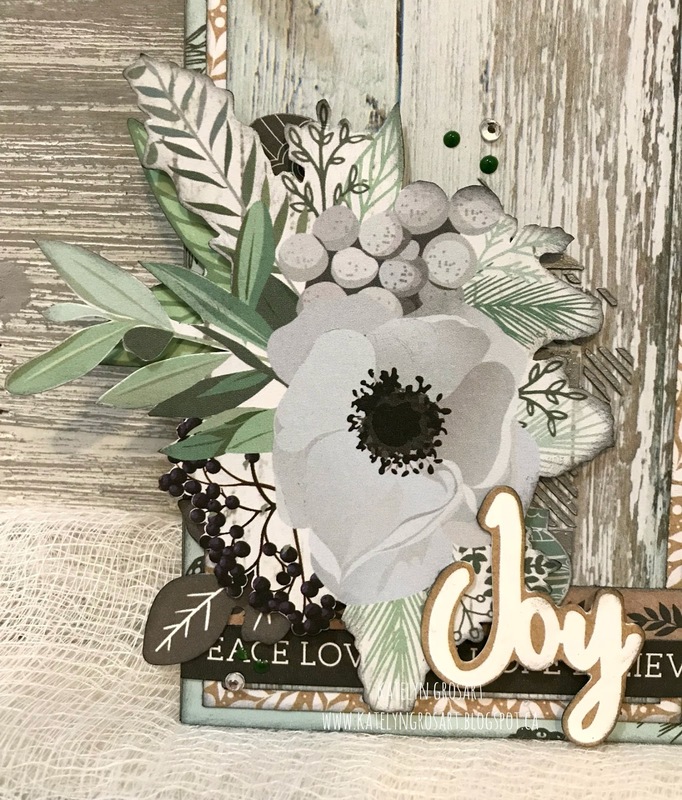 In the bottom right hand corner of the layout, I used Tim Holtz's Plaid Layering stencil along with Tonic Studio's Nuvo Mousse in Gumball Grey. 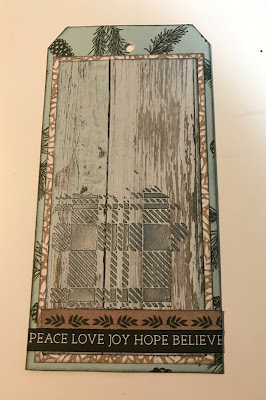 Once the paste had dried, I embellished the corner with borders and fussy cut images from the papers as well as a few of the collectables cut outs. The green dots were created using Tonic Studio's Nuvo Drops in Woodland Green. I also used a few of the clear rhinestones in amongst the flower. 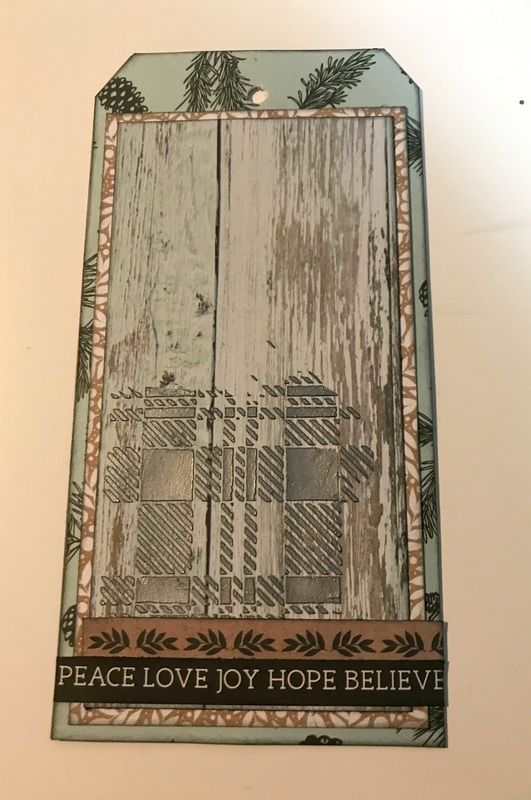 While I still had the Plaid Layering Stencil and Nuvo Mousse out, I added some plaid in the top left hand corner of the patterned paper. 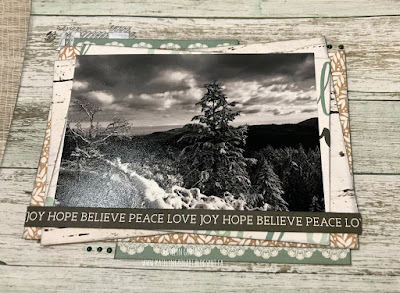 For the photo mat, I cut a few different sized patterned paper pieces and layered them on an angle in behind the photo. In the bottom left and top right hand corners of the photo, I added a few dots using Tonic Studio's Nuvo drops in Woodland Green. 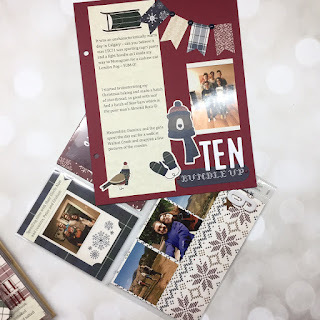 For my last project, I created another 10" x 10" layout using some of my leftover pieces from creating the other projects. In the bottom right hand corner of the photo, I layered some of the borders from the bottom of the patterned papers along with some fussy cut flowers and ornaments as well as the arrow from the collectables. Here's a close up shot of the the ornaments layered in amongst the flowers. In the top left hand corner of the photo, I used fussy cut flowers, ornaments and a few of the die cut images from the collectables. 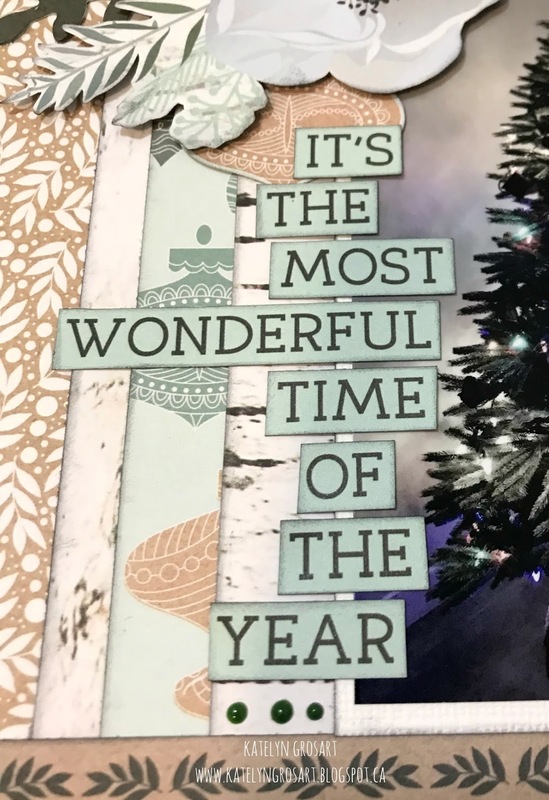 To get the "It's The Most Wonderful Time Of The Year" sentiment, I cut it apart from one of the borders found at the bottom of the patterned paper. 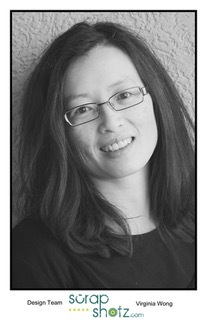 Once it word was cut apart, I adhered them as desired along the left hand side of the photo. 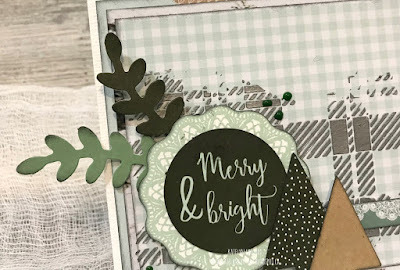 At the bottom of the last word, I added three little dots using Tonic Studio's Nuvo Drops in Woodland Green. Sylvie here sharing two layouts featuring the beautiful Kaisercraft Mint Wishes collection. 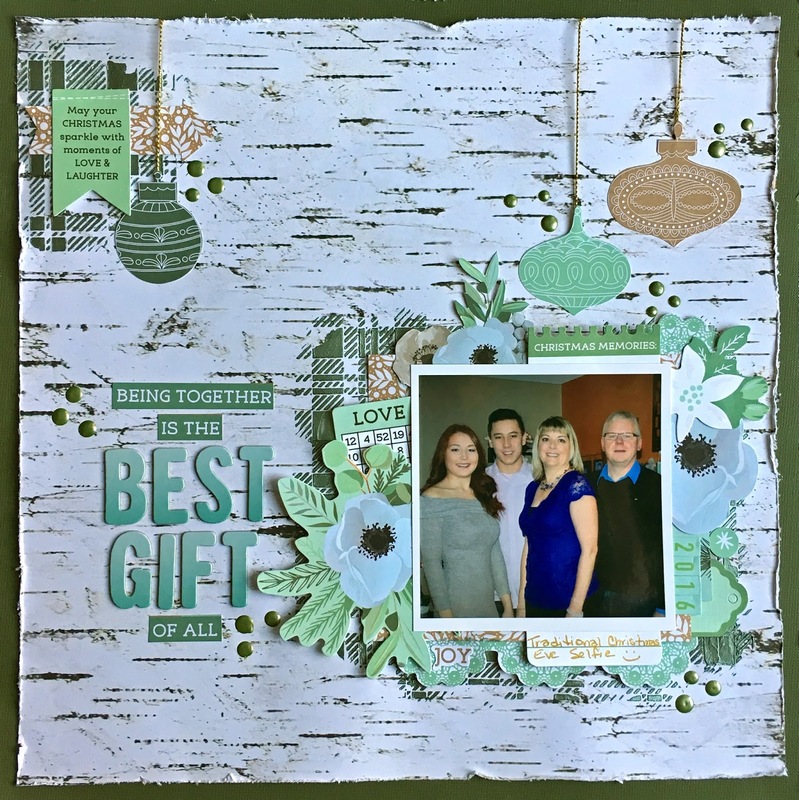 My first page was created by fussy cutting the log images from one of the patterned papers. You would think it would take a lot of time, but it was pretty easy cutting since the logs weren't true circles. LOL! 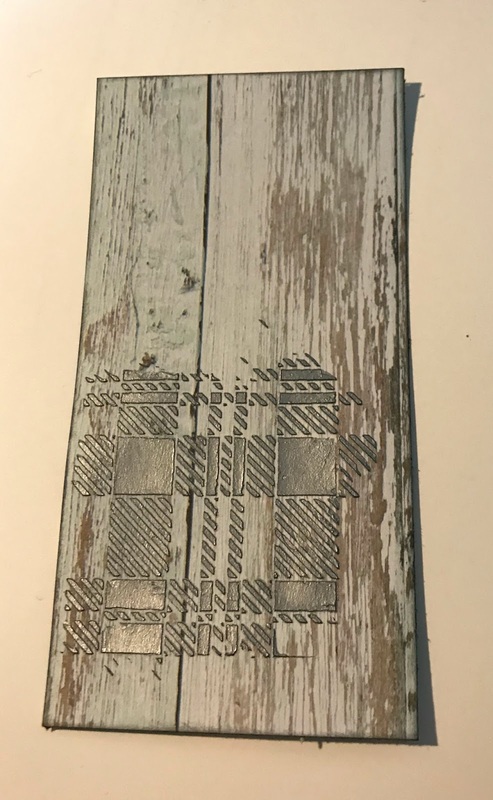 Once the logs were cut out, I inked the edges with Black Soot Distress Ink to hide the white edges of the paper and to make it look like bark. To give the look of snow, I then splattered them with some white acrylic paint that was diluted with a bit of water. Once it was dry, I adhered the pieces into a wreath shape on a piece of kraft cardstock. Some of the pieces were adhered with foam adhesive to give dimension. To decorate the wreath, I cut up the holly border sticker and tucked them in around the circle. I finished it off with some Want 2 Scrap rhinestones. The flowers are from the sticker sheet and the bow was cut from another patterned paper and a Silhouette cut file. I used some Thickers for the title and a little gold mist for some splatters around the wreath. My next page isn't "Christmassy" at all! When I received the kit in the mail, these photos were already sitting on my desk waiting to be scrapped. I thought the colours worked beautifully with the kit. 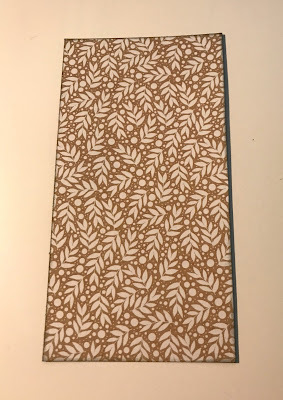 I started by using the smooshing technique on the background with some Peacock Feathers Distress Oxide ink onto the checked patterned paper. 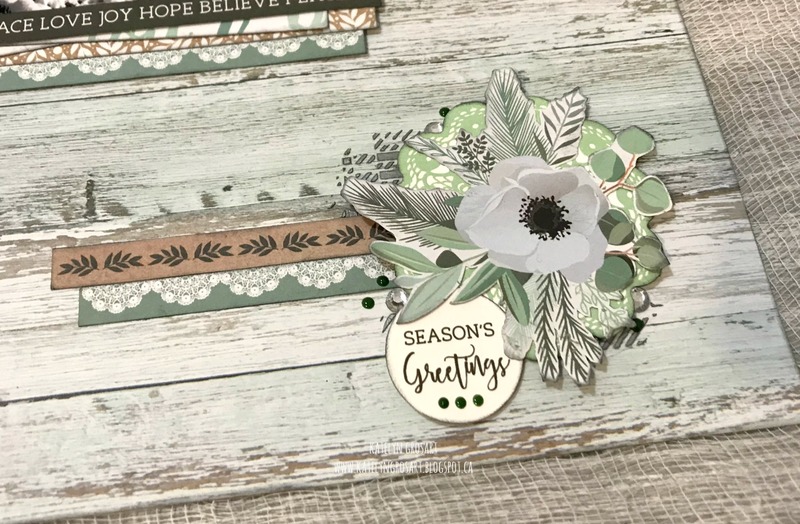 I had already cut the leafy die cut from some white cardstock and using some Nuvo Mousse and a paint brush, I painted the cut file to make it green. 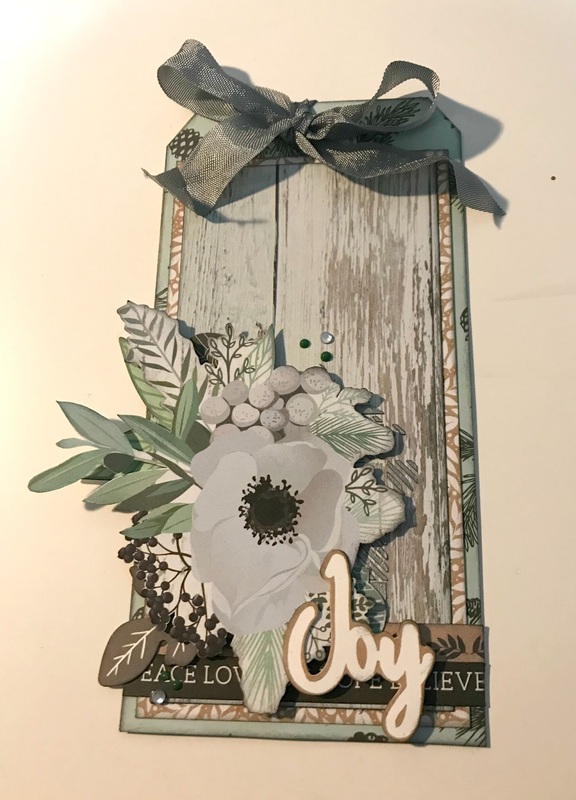 I did some more fussy cutting for the flowers and embellished the page with some Nuvo Drops and a couple hearts that were punched out of more white cardstock and painted with the Nuvo Mousse. I used some old stickers from my stash and Thickers for the title. I just love this page and am pretty proud of myself that you can't tell that this was supposed to be a Christmas line! I hope you enjoyed a warm and wonderful Christmas with your family & friends. I am back on the blog today to share a twist & pop card I made using product that is available at the Scrap Shotz online shop. 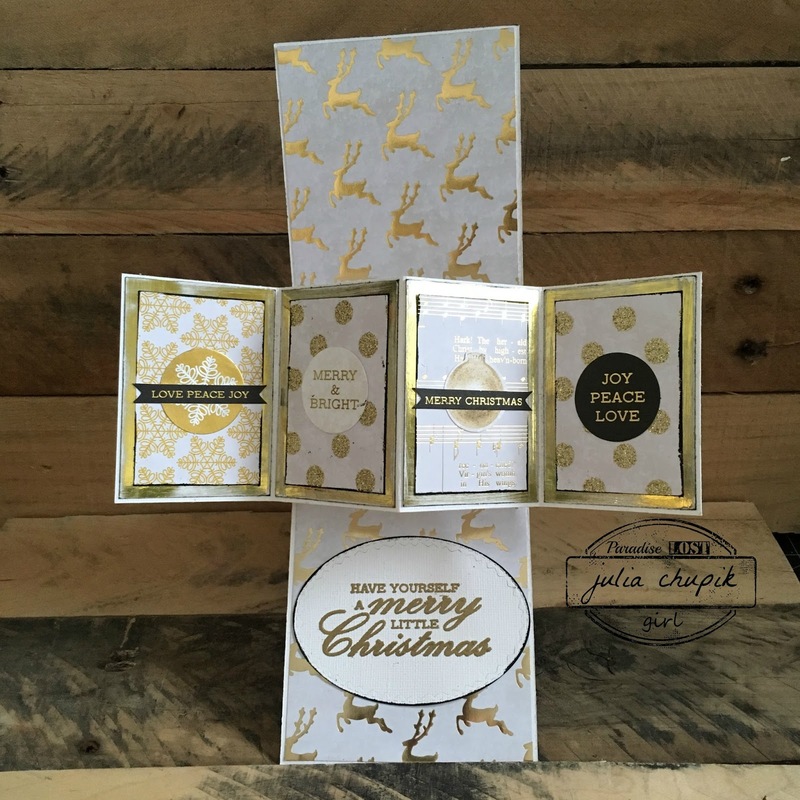 This was my first attempt at a twist & pop card. If you are interested in trying one I suggest taking a look at Karla Yungwirth's tutorial video. 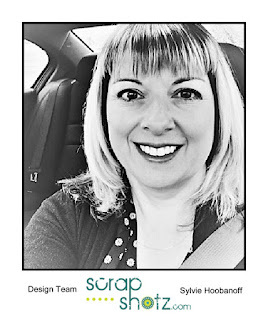 It's the one I referred to when making my card. Check out the video to see the card in action and some closeups. 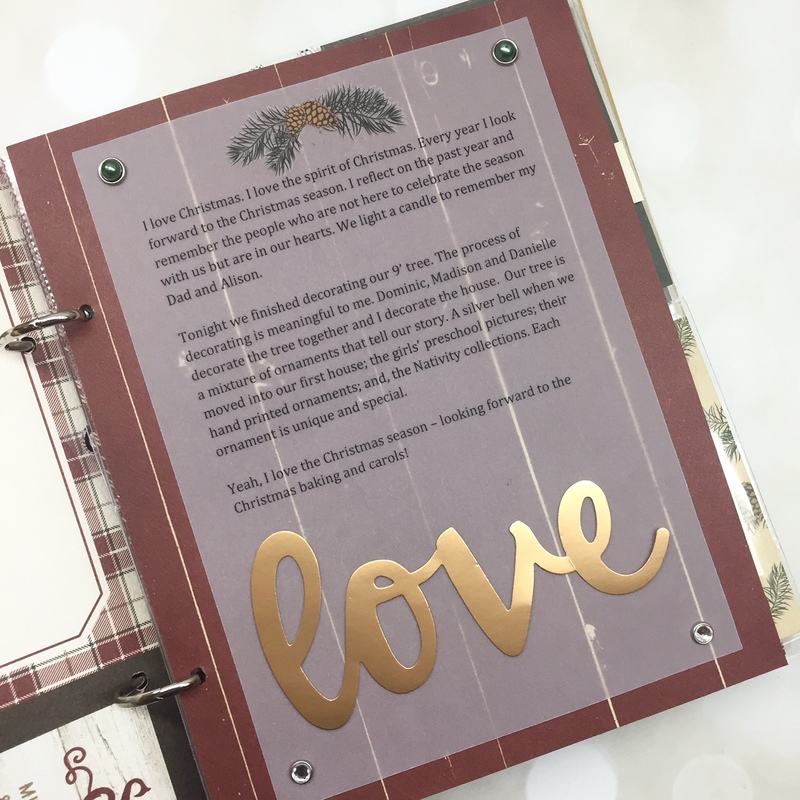 Christmas is right around the corner and I thought today I'd share with you a few last minute projects to add to your gift or to send a card in the mail. 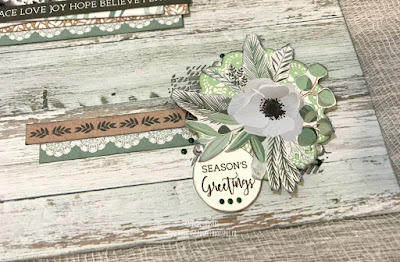 These two projects feature Kaisercraft's "Mint Wishes" collection, which is available at Scrap Shotz's. 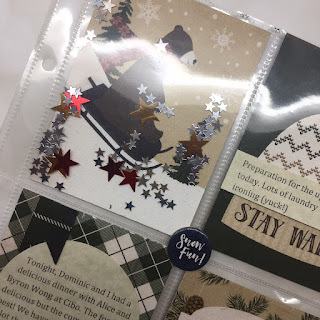 To kick off my post, here is my Merry & Bright Christmas Card featuring a few of the die cuts from the Mint Wishes Collectables. To embellish the top left hand corner of the Merry & Bright sentiment, adhere a few of the leaves behind the doily. 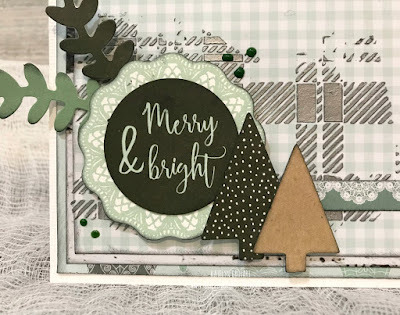 On the top right hand side of the Merry & Bright, create three dots using Tonic Studios - Nuvo Crystal Drops in Woodland Green. 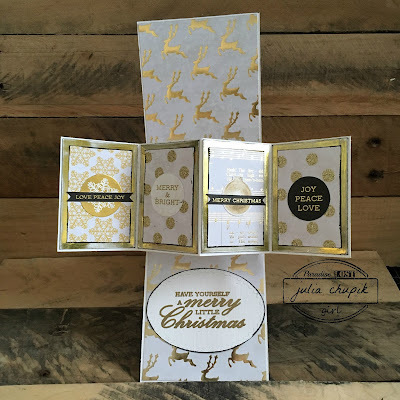 In the bottom right hand side of the Merry & Bright sentiment, adhere two of the tree die cuts. With the die cuts adhered, create two dots using Tonic Studios - Nuvo Crystal Drops in Woodland Green in the bottom left hand side of the Merry & Bright sentiment. To finish, cut a cardbase from white cardstock that measures 5 1/2" x 8 1/2". Adhere the card front to the cardbase. For my second project today, I created a Joy Gift Tag that's perfect to add to any Christmas Gift Bag. 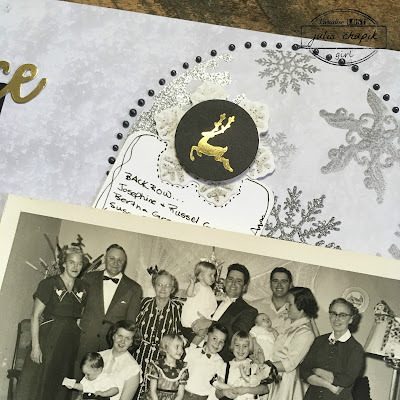 You'll want to read below as I've created a tutorial for you. 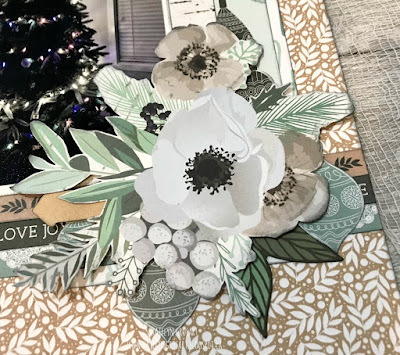 To start, trace your tag around one of the patterned paper pieces from the Mint Wishes collection. Once the tag has been traced, cut the tag out. Make sure to punch a hole at the top of the paper for your ribbon. 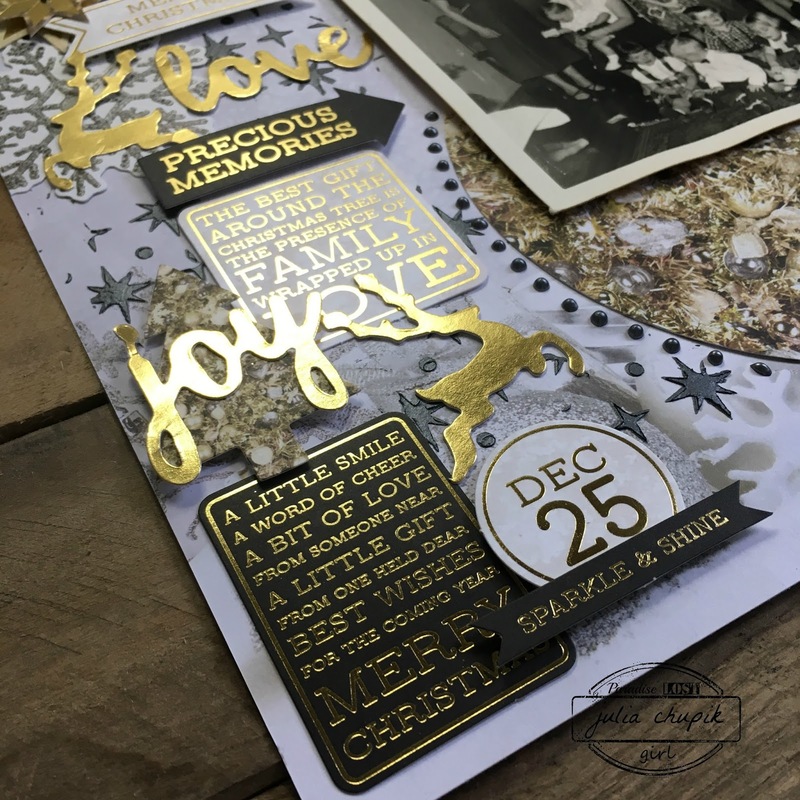 Ink the edges of the paper tag and tag using Black Soot Distress Ink and a blending tool with foam. 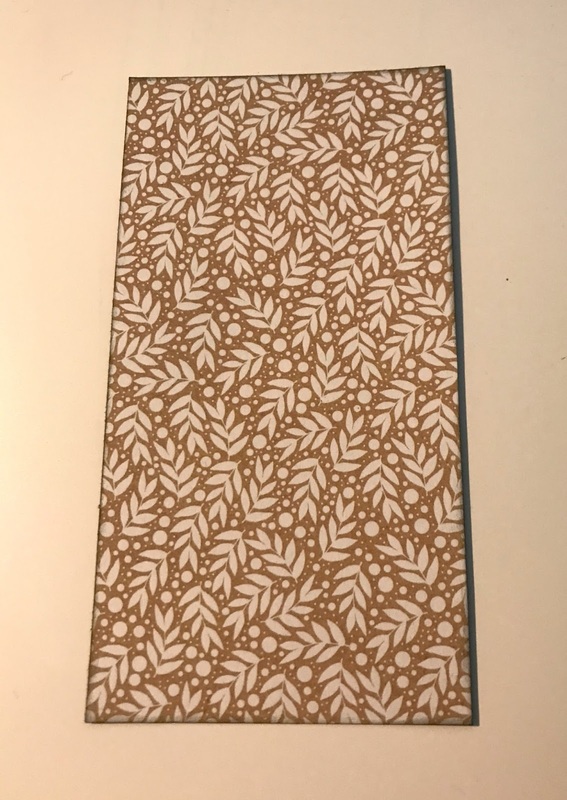 From the leaf kraft patterned paper, cut a piece that measures 3 1/8" x 5 3/4". Ink the edges of the patterned paper using Black Soot Distress Ink and a blending tool with foam. From the wood patterned paper, cut a piece that measures 2 5/8" x 5 1/4". 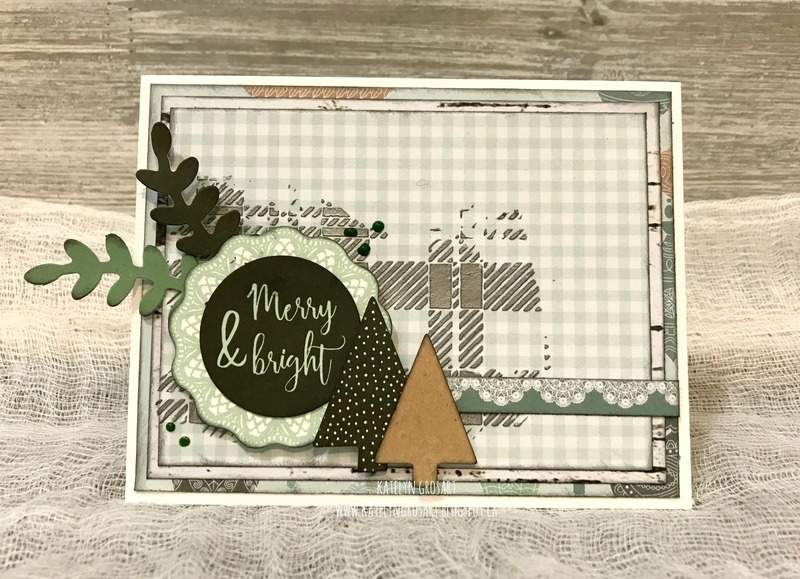 Place the Plaid Layering Stencil in the bottom left hand side of the patterned paper. Apply Tonic Studios - Nuvo Embellishments Mousse in Gumball Grey, through the stencil. 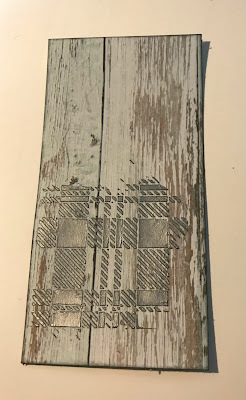 Remove the stencil and allow the paste to dry. 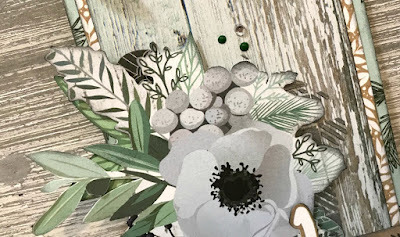 Ink the edges of the patterned paper using Black Soot Distress Ink and a blending tool with foam. 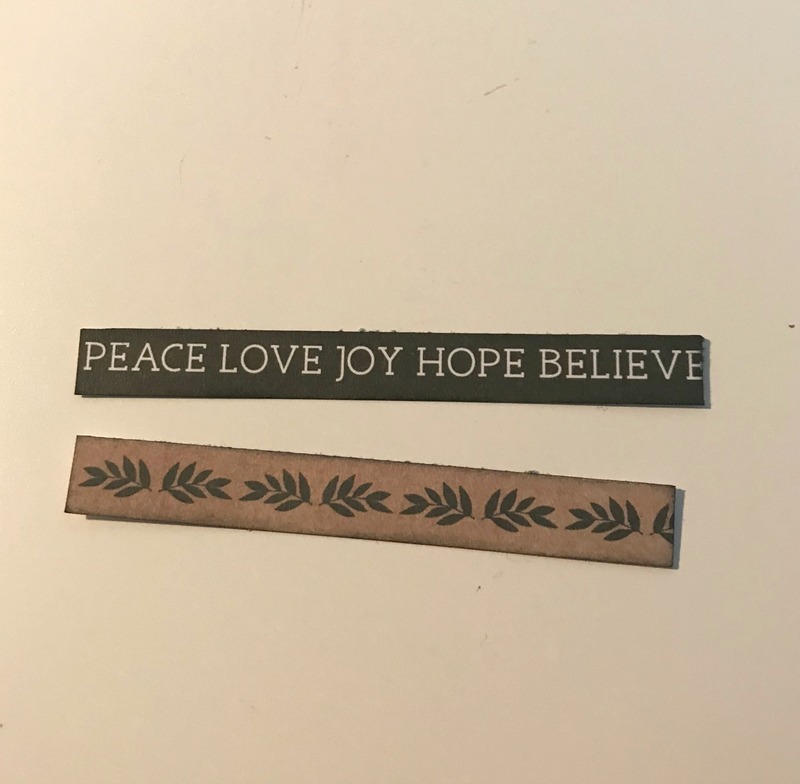 From the Mint Wishes Collectables, pull out the joy word and two leaves. Ink the edges of the die cuts using Black Soot Distress Ink and a blending tool with foam. 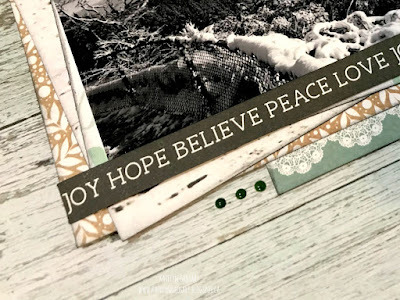 From two of the patterned papers, trim off the borders from each patterned paper piece. 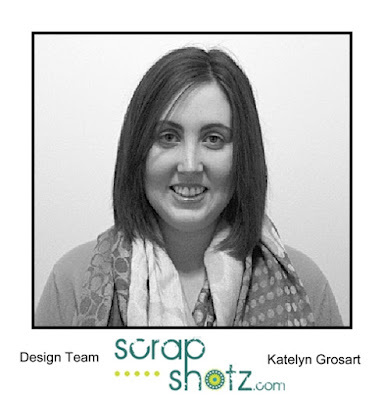 Cut one border down to 3" and cut the other border down to 3 1/8". 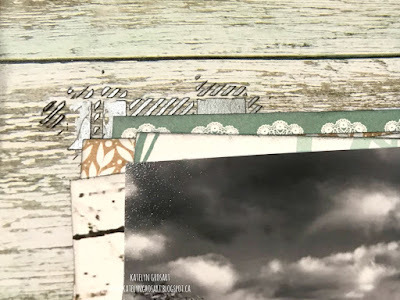 Ink the edges of the borders using Black Soot Distress Ink and a blending tool with foam. From the floral paper, fussy cut one of the flowers out. 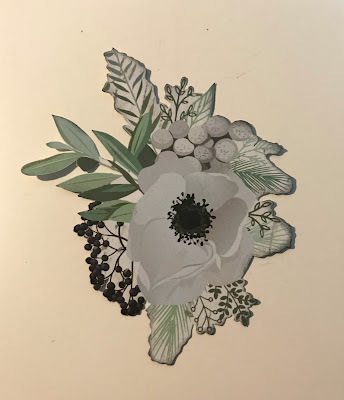 Ink the edges of the flower using Black Soot Distress Ink and a blending tool with foam. 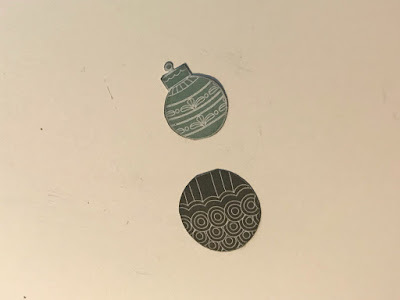 From the Christmas balls paper. 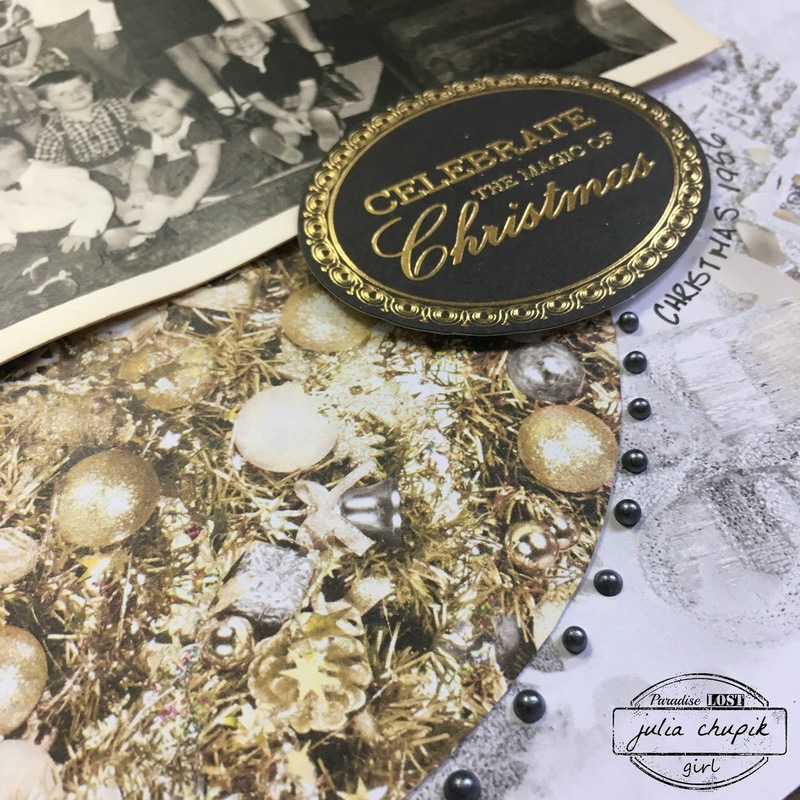 Fussy cut two Christmas balls out. Ink the edges of each Christmas ball using Black Soot Distress Ink and a blending tool with foam. Adhere the patterned paper tag to the tag. Adhere the leafy kraft patterned paper to the patterned paper tag. 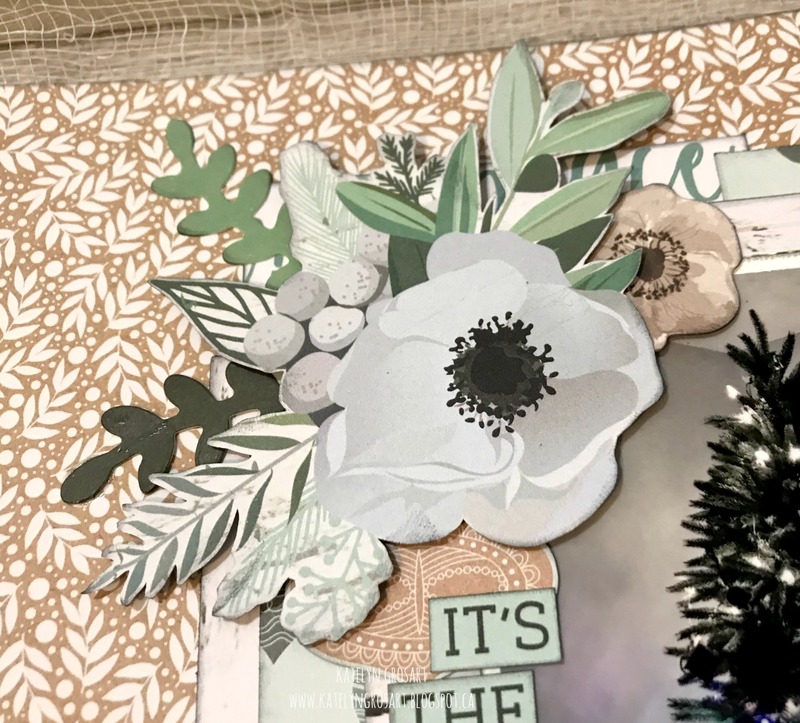 Adhere the wood patterned paper to the leafy kraft patterned paper. Adhere the 3" border 1/2" from the bottom of the tag. Adhere the 3 1/8" border slightly underneath the 3" border. Foam square the flower in the bottom left hand corner of the tag. Adhere one leaf and one Christmas ball on the top left hand side of the flower. Adhere the other leaf in the bottom left hand corner of the flower. Adhere the other Christmas Ball in the bottom right hand side of the flower. Adhere the Joy sentiment slightly over top of the flower. 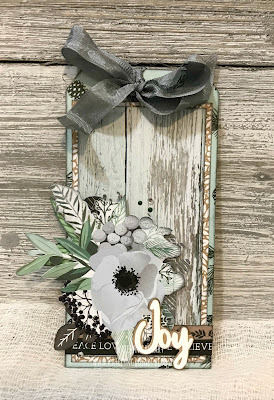 Add a ribbon bow to the top of the tag. 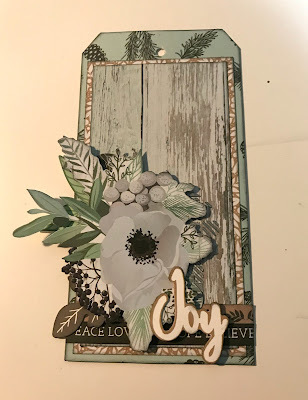 To finish off the tag, create two dots using Tonic Studios - Nuvo Crystal Drops in Woodland Green in the bottom left hand corner along with a small crystal rhinestone. In the top right hand corner of the flower, create two dots using Tonic Studios - Nuvo Crystal Drops in Woodland Green, along with a small crystal rhinestone. Allow for the dots to dry. 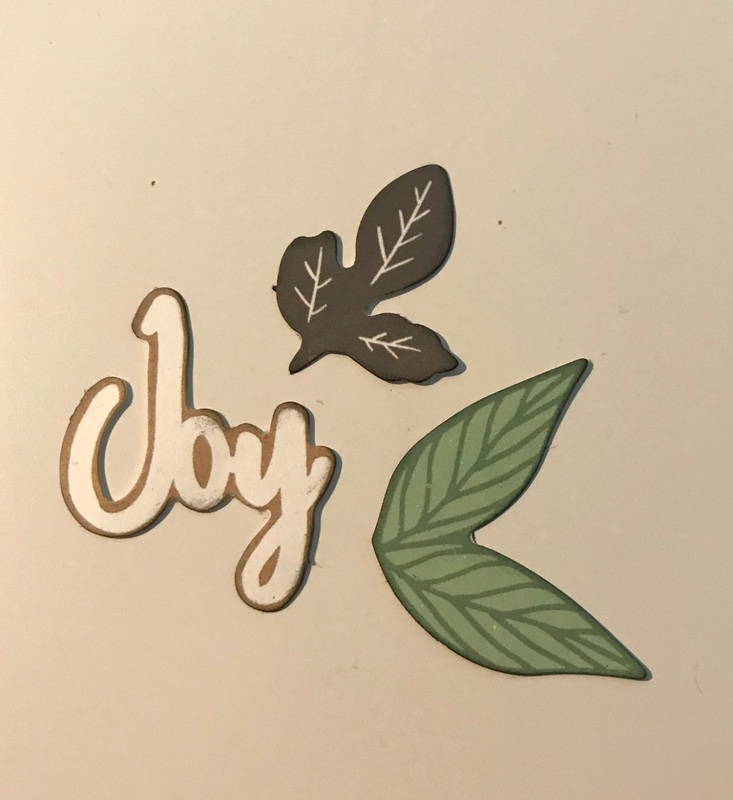 Here are a few closeups of the Joy Gift Tag. And here's the finished Joy Gift Tag. 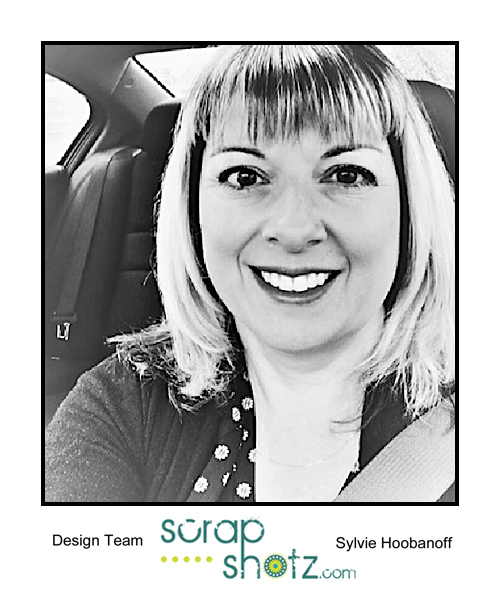 Merry Christmas, Scrap Shotz Fans! 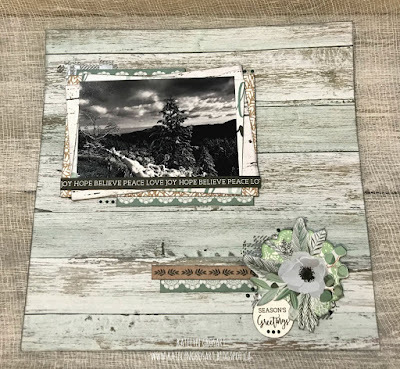 It's Julia here and today I am sharing a 12x12 layout I created using some product available at the online store. 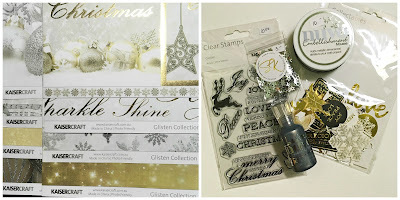 I used some paper & ephemera from the Kaisercraft Collection - Glisten, Nuvo Embellishment Mousse & Nuvo Crystal Drops. The photo I chose for my layout one of my dads family taken at Christmas in 1956. The black & white photo works really well with the gold & silver of the pattern papers. 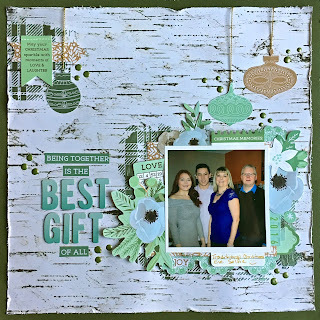 The layout was inspired by the December Sketch from Creative Scrapbooker Magazine. 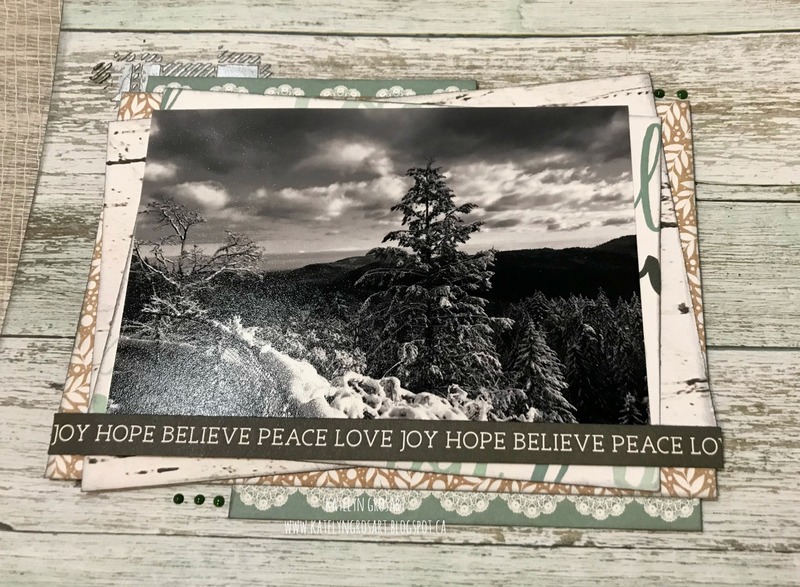 My first step was to apply some Nuvo Embellishment Mousse through the Starry stencil from Tim Holtz/Stampers Anonymous. This medium is so luscious and gorgeous. 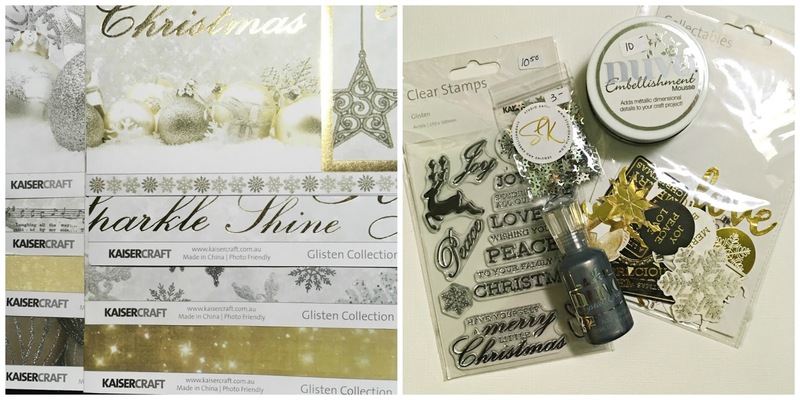 I used a lot of the embellishments from the Glisten Collectibles pack down the left side of my page. Some of them are adhered to the page and others are popped up using dimensional foam adhesive. I outlined my pattern circles with Nuvo Crystal Drops - Liquid Mercury. 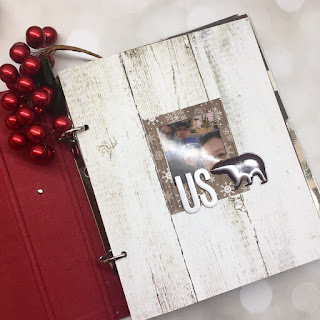 I used a piece of cardstock and a couple of embellishments from the collectibles pack to make a hidden journal card. 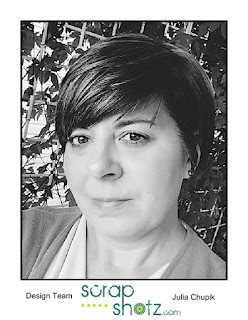 Thanks so much for visiting the blog today! I'll be back next week with another project. 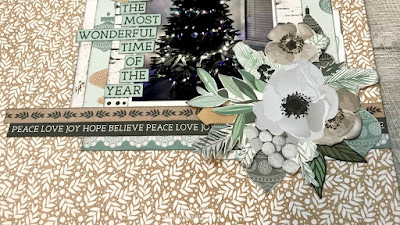 Today I'm sharing some pages made with the stunning Kaisercraft Mint Wishes paper pack. This beautiful kit is so easy to work with. 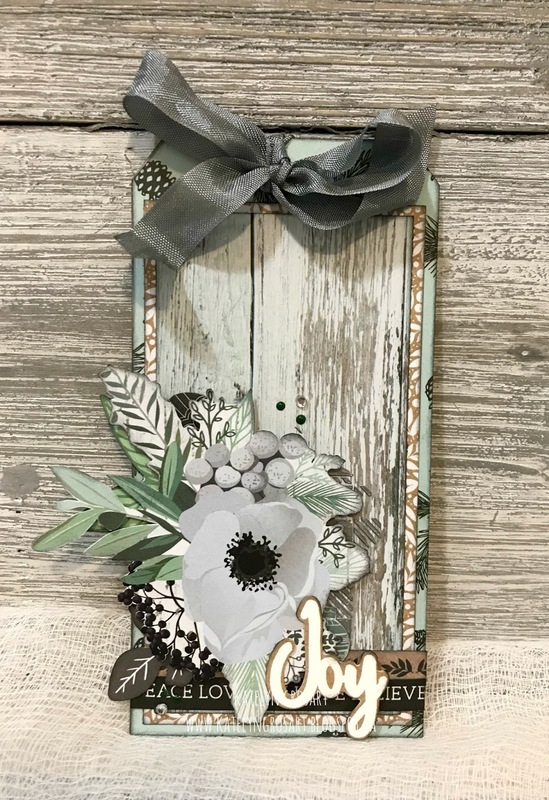 I love wood prints and the colour palatte is so pretty. 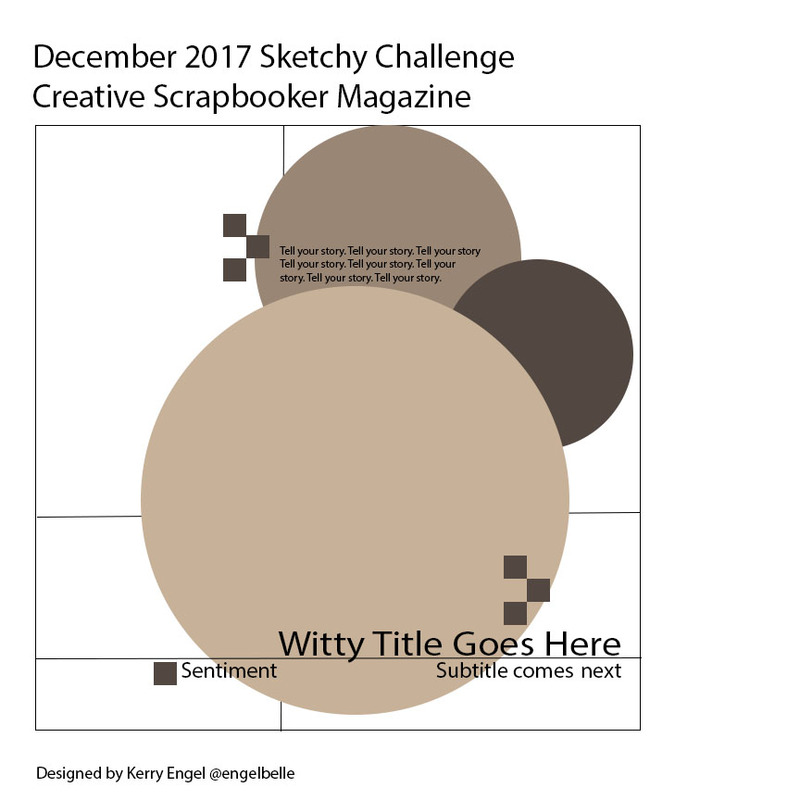 My first project is based on the Creative Scrapbooker Magazine sketch for December. When I saw the sketch, I thought of Christmas ornaments, so using my Silhouette and a Lori Whitlock cut file, I cut out some ornaments. I wanted to bling up the ornaments so the dots on the large ornament were covered in Nuvo Crystal Drops. 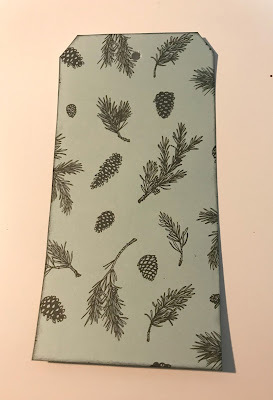 Using paper glue, I painted the leaves and pinecones and sprinkled loose glitter over it. And I did the same thing with the word "joy" on the small ornament. When it was dry, I covered it with more Nuvo Crystal Drops. Here is a closeup of the details. They are hard to see, but noticeable in real life. For my next page, I started with some Nuvo Embellishment Mousse and a Tim Holtz Stencil in the top left corner and where I wanted to place the photo. 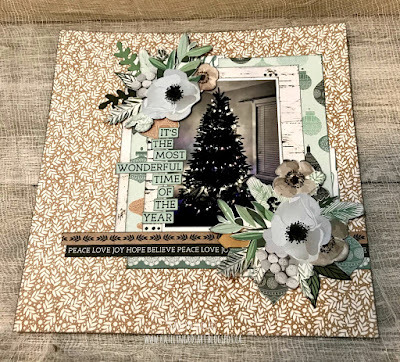 I decorated the page with die cuts and stickers from the Mint Wishes collection. The title is made by cutting a branding strip and a Thickers set. I finished the layout by using some Nuvo Drops and more Christmas string to once again "hang" the ornaments. The edges were distressed and then placed on a piece of green cardstock from my stash. This was the first time I've used the Nuvo Embellishment Mousse. It gives such a nice shimmery texture to the page. Very cool product! I just LOVE this collection! It is so easy to work with. I'll be back in a few days with a couple more. 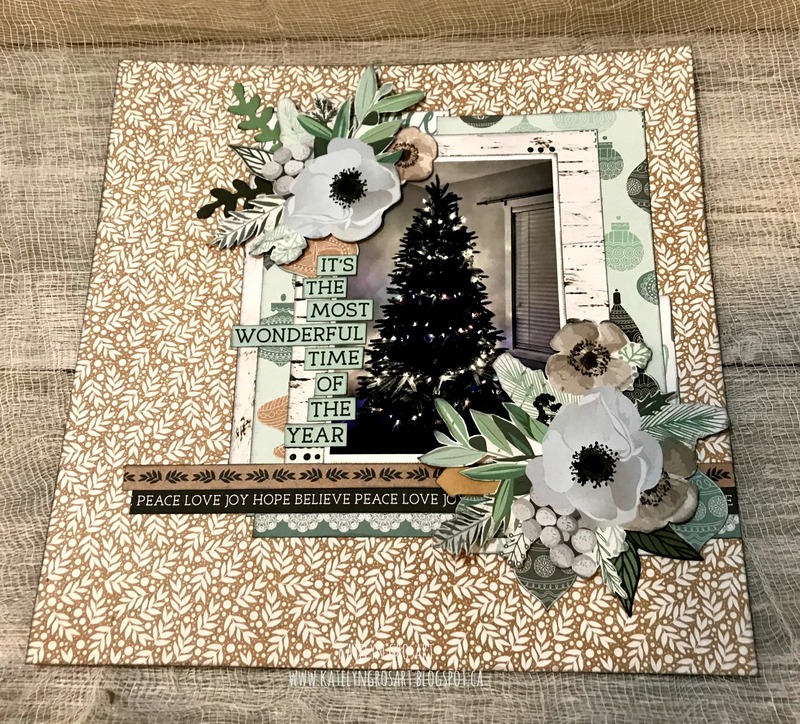 Wow, the December Scrap Shotz kit has been so inspiring for me. 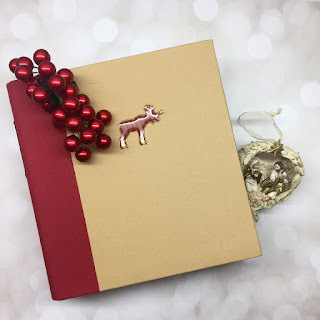 I am super excited to share my December Daily with you. 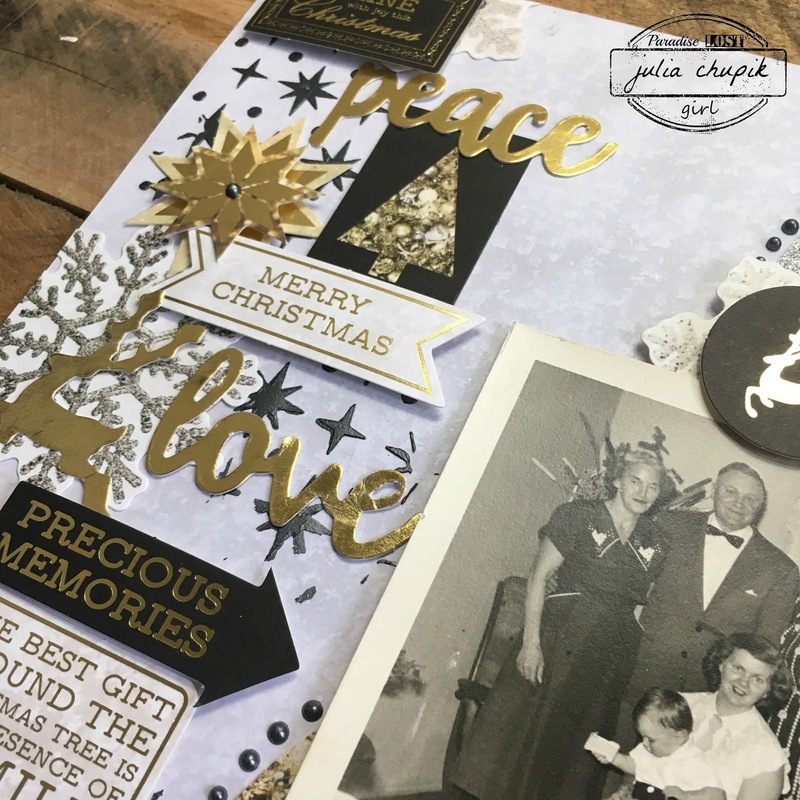 This year I've kept it relatively simple and focussed on specific moments of the day and a few days of reflections. 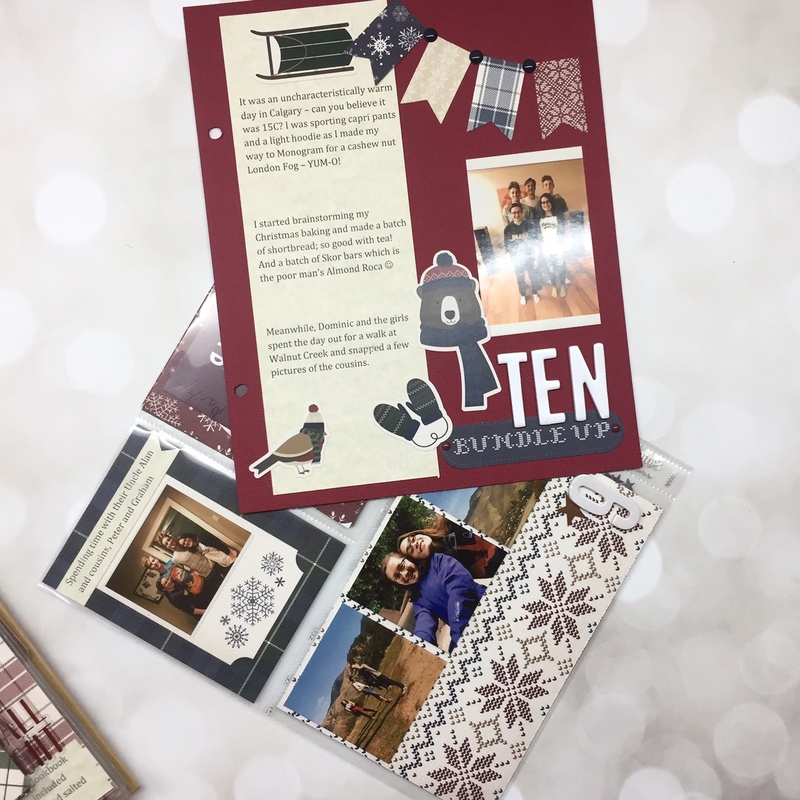 In the past I've used a Simple Stories binder and their inserts; they were part of a kit one year and let's say I was smitten! I kept the cover simple and focussed a lot on our story this year. The first few pages of my album are shown below. 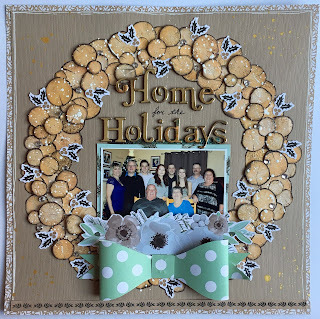 All the supplies are from the December Scrap Shotz monthly kit or tidbits from previous Scrap Shotz kits. My apologies for the glare on the glossy photos. They are from my Polaroid Zip, not the best but definitely fun. You will see how much I love the satin alphas and dimensional stickers. Subsequent days.... showcasing the rub ons and brads. New for me this year is combining days together on a page. Also I cracked open my Fuse and used it to seal the glitter, sequins and beads in the pockets. It was SO SO easy; why didn't I use it sooner? Here is a close-up of the pocket - what is fun is that you can shake it and it becomes a paper snow globe? I have different shapes and sizes of pages, from giant tags to half circles. Some days I journal alot and others not as much. I include the good and not so good. What I love about this kit is the amazing pattern papers as well as the accents. My foundation pages are created and awaiting pictures and just a few more of the enamel drops to go! 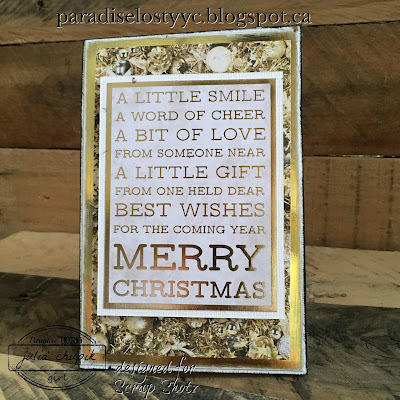 Wishing you all a very Merry Christmas and Happy New Year - thank you for dropping by! 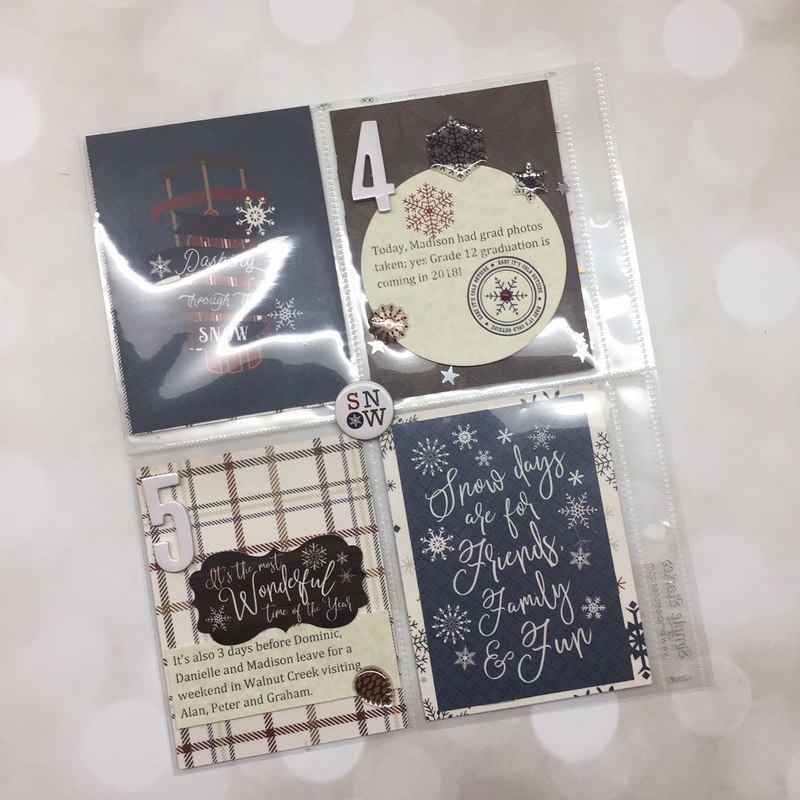 Cabin Fever Scrap Shotz December Kit Projects! 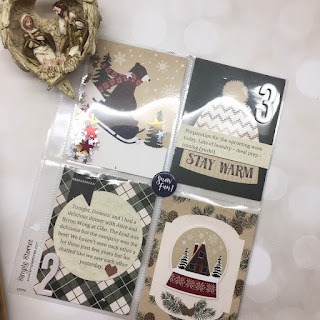 December Monthly Kit with Karla!